Click here to get the eBook, ‘Buteyko Breathing Technique for Sleep Apnea’! Did you know that there are simple, effective treatments for sleep apnea that can be done at home? Among other treatments, sleep apnea sufferers who can’t tolerate CPAP can do mouth and throat exercises, singing exercises, or play the didgeridoo. And these have all been proven in scientific trials to cure (or significantly reduce) obstructive sleep apnea. Another, more recent, alternative sleep apnea cures is the Buteyko Breathing Method. How Was the Buteyko Method Developed? Also known as the Buteyko Breathing Technique (BBT), this is a complementary therapy that was developed in 1950 by Konstantin Pavlovich Buteyko a medical doctor from Ukraine. The technique was formulated based on the observation that many major respiratory conditions like asthma stemmed from hyperventilation or chronic deep breathing. At the age of 20, Dr. Buteyko was diagnosed with severe hypertension that doctors believed would allow him to live for only a few more months. One night, while contemplating his limited days of living, he observed that his breathing was deep and heavy. This led Dr. Buteyko to believe that his way of breathing was the source of his illness and not a symptom of it. Testing his theory, Dr. Butetyko tried to breath in a more relaxed manner, taking shallow breaths. He experienced a relief that was almost instant. He continued to share this information with patients in the hospital, who also responded positively to the method. From here he further developed the Buteyko Method, which he gained a patent for in 1987. A clinic was set up using this technique as primary treatment for patients. Through the years, about 150 different ailments were successfully treated with the BBT. However, it was not until 1968 that other institutes did research on this and it was only in 1995 that Dr. Buteyko’s name appeared in medical literature. What Underlying Symptoms Does the Buteyko Method Treat? BBT was developed on the basis of hyperventilation, which is an underlying cause for many diseases such as asthma. When carbon dioxide is in its carbonic acid form it plays a key role in regulating the acid base balance of the system. When hyperventilation occurs, breathing becomes faster and deeper, reducing the amount of carbon dioxide in the body and resulting in a condition called hypocapnia that disrupts the acid base balance. This will cause a drop in pH levels of the blood, making it more alkaline, which in turn affects the harmony between hemoglobin and oxygen molecules as the body tries to balance levels. In the end the system delivers less oxygen to the tissues causing all types of illnesses – including sleep apnea. 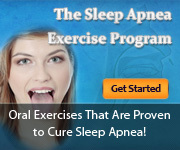 Interested in learning the exact Buteyko breathing exercises that can cure sleep apnea? Please click here to get your copy of “Buteylo Breathing for Sleep Apnea”.